Charging the Trinamool Congress government with bringing only "fear, hunger and corruption" to West Bengal, BJP president Amit Shah on Tuesday dared Chief Minister Mamata Banerjee to seek a CBI inquiry into the sting operation to let the truth come out.Addressing the media in Kolkata and holding public rallies in Nayagram in West Midnapore district and Raghunathpur of Purulia district, Shah also challenged Banerjee to throw out her party leaders caught in the sting operation "taking bribe". "If you feel your people are innocent, then you should immediately send in a request to the central government for a CBI inquiry into the Narada sting operation. "If Mamata di places a request, within 36 hours we will ensure 'doodh ka doodh aur pani ka pani' (the truth will come out)," Shah said in Kolkata. Rubbishing the CPI-M and the Congress's charges of a "match-fixing" between the BJP and the Trinamool to cover up the sting issue, Shah defended the home ministry move for a forensic test of the footage of a sting operation accusing Uttarakhand Chief Minister Harish Rawat of indulging in horse-trading to save his government. "In Uttarakhand, the governor had sent a CD of the sting along with a report to the union home ministry. But here if Mamata didi makes such a request, immediately a CBI probe will be initiated," said Shah.Asked why wasn't the CBI taking suo motu cognizance, Shah replied: "Are you not aware about the federal structure, or else, let Mamata say that you don't have to care about the federal structure and send the CBI." Earlier this month, the Narada News portal uploaded on its website video footage of what it claimed was a sting operation in which several top-notch Trinamool leaders, including former central ministers, incumbent state ministers and MPs were seen allegedly accepting bribe in return for favouring a fictitious company.Shah also ridiculed the Banerjee government over its "attempt to conduct a sting operation on BJP national secretary Rahul Sinha" and demanded the removal of city police commissioner Rajeev Kumar for his "direct involvement" in the "botched sting". "I have never heard of a state government sending policemen to conduct a sting, they tried to implicate our leader Sinha," Shah said, referring to the sting where two city police personnel allegedly tried to conduct a sting. Describing the Banerjee government as a "shadow of "Left Front's 34 years of misrule", Shah said the Trinamool has taken Bengal to destruction with only the bomb-making industry flourishing. "In the name of change, Mamata has only scripted a tale of destruction. It's now for the people to ask her what she has given them in these five years. "This government which came to power with the slogan of 'maa, maati and manush' (mother, land and people) has now turned it to 'bhay bhookh and bhrashtachar' (fear, hunger and corruption)," he said.Referring to the multi-crore-rupee Saradha chit fund scam, Shah charged Banerjee with walking the path of the Communists. "If the chit funds were born under the Left, they flourished under Mamata. Seventeen lakh families in Bengal have been ruined by Saradha. Who will account for their miseries?" he asked. Calling the Communists and the Trinamool two sides of the same coin, Shah also ridiculed the Congress-Left Front tie-up for the Bengal polls. "The Communists, who talk about principles, need to clear their stand. In Kerala they are engaged in fighting but here it's 'ILU ILU' (with Congress)," said Shah, using the Bollywood-inspired initials for 'I Love You'.Addressing a party rally in Nayagram, Shah ridiculed the Trinamool over its "journey from Saradha to Narada". "From morning to afternoon, from evening to night, Trinamool leaders are busy taking bribe". 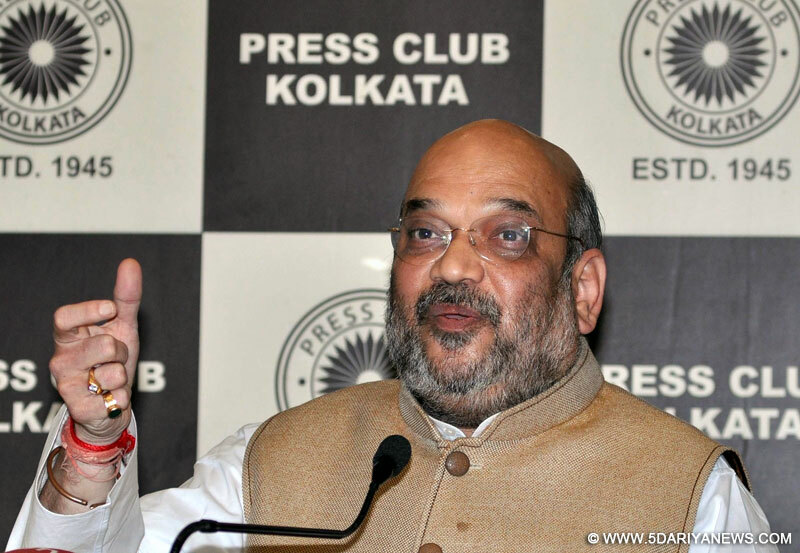 "It's her duty to throw out the leaders who have taken bribe, but Mamata will not do that because she is afraid that those who have taken the money will reveal everything," he said.Claiming that the Banerjee government will never allow central government welfare schemes to reach Bengal, Shah appealed to the people to vote the BJP to power in the state. "Such is the level of corruption here that the money sent by Modi government for the warfare of Bengal doesn't even reach you. "Modi has allotted Rs.80 lakh for each village and Rs.21 crore for every city, but if the Mamata government is here, that money will never reach you. "As long as Mamata is here, no central benefits, be it the crop insurance scheme or the Mudra bank initiative, will reach you," added Shah.